Your generosity empowered the Fund for Assistance to ROCOR to send over $19,000 to the Russian Orthodox Mission in Haiti. Unfortunately, more troubles followed the hurricanes. The economic situation in Haiti remains critical, and, according to Fr Gregoire Legoute, one of the two Russian Orthodox priests in Haiti, the government does not provide social care, for which the people have to rely on charitable and religious organizations, including the ROC mission, which ministers to the sick and suffering, comforts the depressed, and provides care and education to children in parish schools. There are about 2,000 Russian Orthodox Christians in Haiti, most all of them indigenous. The number constantly increases, owing to the tireless missionary efforts of the island’s two ROC priests, Fr Jean Chenier-Dumais, and Fr Gregoire Legoute. Every week the two priests travel great distances by public transport between 5 parishes and 2 chapels located in different cities on the island. According to Fr Daniel McKenzie, the mission’s administrator, Fr. Jean is compelled to travel north to his parishes, often spending hours on the back of motorcycle taxis holding the things needed for the services in Cap Haitien (he told us he had fallen from these motorcycles already three times). Because of the great distances, bad roads and a lack of cars for the priests, travel remains by far the mission’s greatest challenge and vehicles for the priests – their greatest need. Their second greatest need is the acquisition and sufficient rent of church buildings. Our Haitian brothers and sisters already know what it feels like to lose a church. 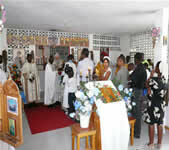 After the Reunification of the Russian Orthodox Church in 2007, the former Haitian Mission Administrator, Fr. Gregory Williams went into schism taking over the church property, including a school and a church building, built mostly with donations from the faithful of the Russian Church Abroad. Now hundreds of faithful gather outside a small rented room converted to a chapel. The Fund for Assistance to the Russian Orthodox Church Outside of Russia is looking for ten parishes to sponsor our Haitian mission by providing them with only $200 a month. This small sum from ten parishes will at least guarantee that our Orthodox brothers and sisters in Haiti don’t have to worry about losing their church buildings. We ask you to help our brothers and sisters in Christ and to further the missionary work of our Church in Haiti.